I recently acquired a mid-1900’s copy of Ainsworth’s Brunton Pocket Transit owners manual. This is the small manual that was included with every pocket transit sold. In 1957 an Ainsworth manufactured pocket transit would set you back $49.50. Wow! 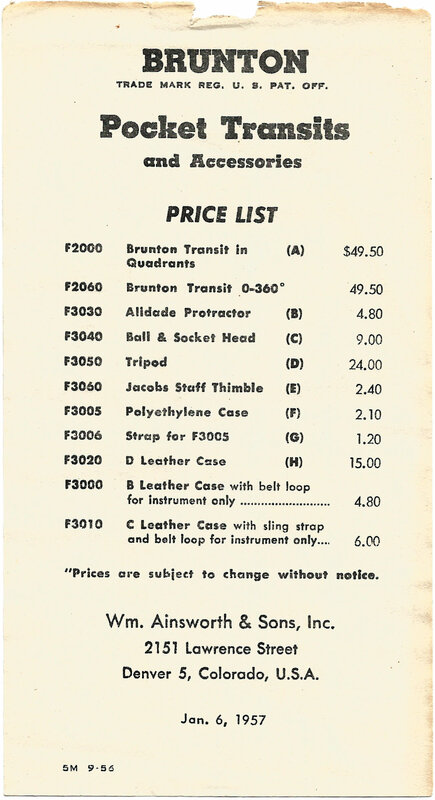 Compared to current pricing for the same item made today by the Brunton Company – $400 – that was quite a bargain. Or was it? There’s no direct comparison between 1957 prices and 2016 prices. If we calculate for inflation using consumer price index numbers, $49.50 in 1957 dollars = $417.52 in 2015 dollars. So the pocket transit buyer in 1957 was actually paying about $17 more in inflation adjusted dollars for his compass. Any way you calculate it a new pocket transit is a pricey piece of equipment. It wasn’t (and still isn’t) a purchase decision a young college student or newly graduated geologist made lightly, but it was a necessary and critical piece of his professional kit. That probably explains why there are so many well used but well cared for examples available today on auction sites like eBay. This entry was posted in pocket transit, topographic, Uncategorized and tagged ainsworth, brunton, pocket transit by Brian Haren. Bookmark the permalink. I just bought an older (1970’s perhaps) Brunton Riverton M2 transit off of ebay and was surprised by the 1957 prices. When comparing to a new transit I guess not all that much has changed by way of inflation. It took a while to find your blog, but I’ve been enjoying the reading. I plan to use it on my backpacking and river trips for determining the height of old trees and the height of cliffs, etc. Never knew these things existed until a couple of months ago and it’s been an interesting time learning to use it . . . accurately. Wish I had it several years ago when I floated through Canyonlands NP. Next time I’ll bring it along.